After her father’s death, Caroline Taylor has grown confident running the Windmill Point Lighthouse. But in 1865 Michigan, women aren't supposed to have such roles, so it’s only a matter of time before the lighthouse inspector appoints a new keeper–even though Caroline has nowhere else to go and no other job available to her. Ryan Chambers is a Civil War veteran still haunted by the horrors of battle. He’s been given the post as lighthouse keeper, and the isolation where he can drown in drink and hide from his past is appealing. He’s not expecting the current keeper to be a feisty and beautiful woman who’s none-too-pleased to be giving up her position. They both quickly realize he’s in no shape to run the lighthouse, but Ryan’s unwilling to let anyone close, ravaged by memories and guilt. Caroline is drawn to this wounded soul, but with both of them relying on that single position, can they look past their loss to a future filled with hope…and possibly love? 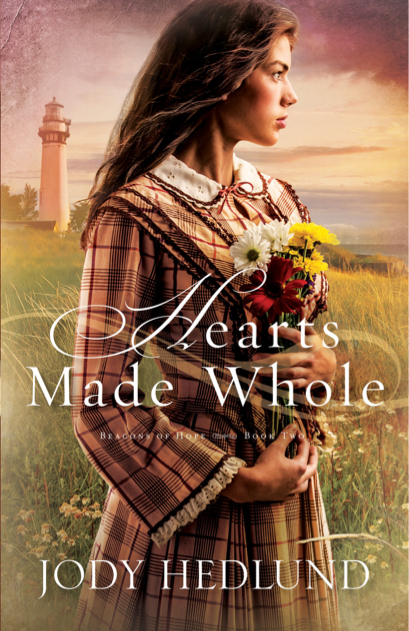 Hearts Made Whole is a lovely read by author Jody Hedlund, and I'm ashamed to say that I think it is the first of Hedlund's books that I have read and I am confident that it will not be the last. The story begins with a bang when Caroline's father is taking the local doctor back across the lake by the lighthouse during a bad thunder storm, sadly their row boat is overturned by the waves and both men perish - their bodies never to be recovered. Caroline and her younger sister Tessa are left in charge of their small twin brothers and their sister, who is bed ridden with a debilitating illness. The local lighthouse inspector is a man who disagrees with the notion that a woman should run a lighthouse on her own - a relatively common view in 1865, but one that Caroline and her friends object to, even to the point of her friend garnering political persuasion in the endeavour to keep Caroline in the position that she's undertaken since before her father perished. Ryan is a young Civil War veteran, unemployed and chosen by the lighthouse inspector to oust Caroline from her position. The only problem being that Ryan really has no clue how to operate a lighthouse - and battling his war injuries and memories, doesn't have the physical or emotional capacity to carry out the role either. He needs Caroline to stay at least until he has a full understanding of the role. Ryan, Caroline and her siblings are terrified and mystified when a series of strange and threatening events start occurring - who is trying to scare them, and why? Is it their strange neighbour? Or the local smugglers? Or is it someone else entirely?